Guy Anthony Vandervell was a hard-nosed industrialist who supported the early BRM endeavours but could not long suffer committee-minded bureaucracy or an element of gentlemanly amateurism, so he set out to build up his own team to beat the Italians - that was the target he felt mattered in the 1950s. His first F1 car had been a Ferrari, named Thin Wall Special after his company's shell bearings and purchased to give the BRM team some experience in actually running a car. Other Ferraris followed (see also Thin Wall), and were raced by the Vanwall team while itS own 2-litre F2 project got under way. That car was completed only as 2.5-litre F1 came in, so it was raced with 2-litre, 2.3-litre and then 2.5-litre versions of the four-cylinder engine that had been largely designed by Norton engineer Leo Kusmicki. 1958. Tony Vandervell's prime racing ambition was fulfilled, and as ill-health took a toll his Vanwall team was run down to a part-time basis, fading away on a low note in 1961. Vanwalls did not carry type or mark numbers, chassis numbers tended to be repeated and each year's output tended to be used as parts bins for the following season's cars. 1954-5 The first Vanwall as such, run as the Vanwall Special, had a chassis on Ferrari lines built by Cooper, and in itS first 2­litre form was distinguished by an ugly surface radiator. It was used through most of 1954 and written off in a Spanish GP practice accident. Four more cars were built on closely similar lines for 1955, and at the end of that season were broken up. 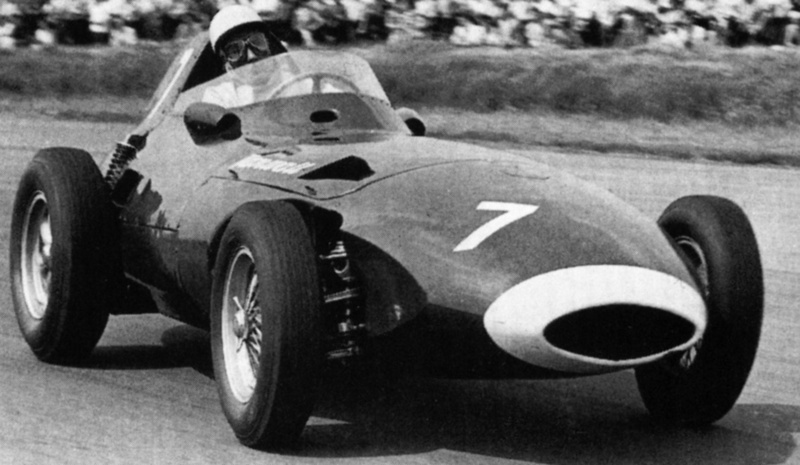 Harry Schell drove one to score vanwall's first race victory, in a heat of the Crystal Palace International Trophy in July 1955. Drivers: Alan Brown, Peter Collins, Mike Hawthorn, Harry Schell, Desmond Titterington, Ken Wharton. 1956-58 The Chapman/Costin cars, the first four being built using some parts from the 1955 vwl-4. Moss drove one to Vanwall's first significant victory, in the 1956 International Trophy, while Schell battled with the leaders in the French GP. The standard of workmanship was high, but the cars were too often let down by niggling faults. These cars were in part carried over to 1957, when coil spring rear suspension was introduced and additional cars completed as the team reached its full strength, in its drivers as well as materials. One car was tried with a streamlined body, and another had a lightweight chassis. In the British GP Moss took over the unwell Tony Brooks' VW4 to score an historic victory. Five cars were improved in detail for 1958, but little effort was made to save weight despite the loss of power as methanol fuel gave way to Avgas (down from a maximum of 285bhp in 1957 to just under 260bhp in 1958). It was a season of triumph as Vanwalls dominated the GPs but one which ended in tragedy as Stuart Lewis-Evans was fatally injured in an accident in the Moroccan GP. Tony Vandervell formally announced the end of the full team. Drivers: Tony Brooks, Stirling Moss, Froilan Gonzalez, Mike Hawthorn, Stuart Lewis-Evans, Roy Salvadori, Harry Schell, Piero Taruffi, Maurice Trintignant. The first Vanwall, driven by Peter Collins during practice for the 1954 British GP. At that stage it had a 2.3-litre engine and the surface radiator on top of the nose was shrouded. The 1955 cars - this is Wharton at Monza - had conventional nose radiators, and for this high-speed circuit the front suspension is partly faired. The abiding Vanwall shape, shown off by Moss in the 1958 British GP. The height of the car is accentuated by its high cockpit surround, and the air intake arrangementS, from the slim nose to the NACA flush ducts, never called for extemporary revision.